Security personnel surround former Chadian dictator Hissene Habre inside the court, in Dakar, Senegal, July 20, 2015. A special court in the Senagalese capital of Dakar began a long-awaited trial Monday against former Chadian ruler Hissene Habre on charges of torture, war crimes and crimes against humanity. Others who identified themselves as victims of Habre's rule were also present, including Fatime Toumle, who called the trial historic. "The start of this trial is a day of joy and satisfaction," she said. "Everyone should be against impunity." Clement Abaifouta, president of the association of the victims of crimes during the Habre regime, recalled being imprisoned in 1985. "[We were] put in inhuman conditions, and given food that most would not give to dogs," he said. "[I] helped bury as many as eight or more fellow prisoners a day." The court, established under an agreement with the African Union, is due to hear from 100 witnesses during the trial that is expected to last several months. Rights groups and a Chad truth commission accuse Habre of being responsible for more than 40,000 political killings, systematic tortures and other violations during his time as president. Judges found sufficient evidence for Habre to be charged after a 19-month investigation. 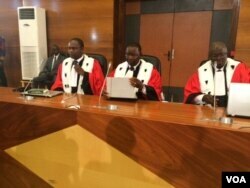 Senegalese League for the Defense of Human Rights President Assane Dioma Ndiaye says the trial must be transparent. Habre, once dubbed "Africa's Pinochet," led the country from 1982 to 1990, when he fled to Senegal after being deposed by current leader Idriss Deby. The United States on Monday welcomed the start of the trial. "This trial is an important step toward justice for the victims of atrocities committed under Habre's rule from 1982 to 1990," said State Department spokesman John Kirby. Kirby said the trial "should serve as yet another warning that, no matter their position, perpetrators of atrocities will be held accountable." U.S. Ambassador at Large Stephen Rapp of the U.S. State Department office of global justice, says leaders should know they cannot get away with crimes committed under their watch. Human Rights Watch called the trial a "milestone in the fight to hold the perpetrators of atrocities accountable for their crimes in Africa and the world." The New York-based rights group also said the case marks the first time a court in one country is prosecuting the former ruler of another country for alleged human rights violations. That is a departure from the last 13 years, during which similar cases have been brought by the International Criminal Court in The Hague. But the ICC has faced criticism for solely pursuing charges of war crimes and crimes against humanity against Africans, and securing only two convictions since it began operating in 2002. A provisional court calendar indicates Habre’s trial will last approximately three months.